Spend too much time in the AR Lab and someone might notice. Unless you're the head of it, that is. This is a powerful effect. The game is built on the premise that your deck has a finite lifespan: eventually you will run out of cards to draw. Of course, you could play with a 100 card deck, but if you do that, your deck is going to be wildly inconsistent. Levy allows you to double your deck's lifespan while letting you still play with a deck that is regular sized. It feels nice to have a Levy in your deck. Did a card you really like get trashed? Are you worried you are going to run out of cards? Would you like to see those nice events you played again? Don't worry about it. Levy will come to the rescue. It feels good. It feels safe. If you are playing MaxX: Maximum Punk Rock, not playing a Levy seems like suicide. You are going to be flying through your deck, and if you don't play Levy, you are going to run out of steam really fast! It's very important. 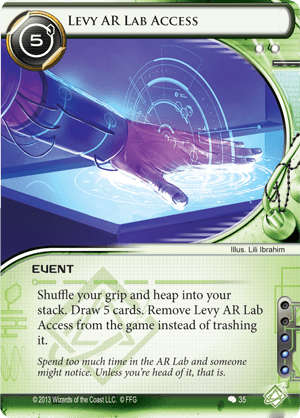 If you are playing Armand "Geist" Walker: Tech Lord, you are probably churning through your deck too, and Levy lets you put all those trashable cards you lovingly included back in your deck so you can trash them again. That's fantastic. If you are playing Prepaid Kate and your deck is full of events that give you money, after you Levy your deck is hyper-efficient: you've installed most of your programs and hardware, every card you draw is a powerful weapon. If you are playing Apex: Invasive Predator, you are likely plodding through your deck, slowly and steadily, maybe with a Chop Bot 3000. Are you really drawing so many cards that you need a double sized deck? Influence is tight! Cut the Levy. If you are playing some Dyper deck that combos Hyperdriver, False Echo, and DDoS for some giant turn where you destroy the corp with Keyhole if you draw through your entire deck, you will have drawn all the cards you need to win the game. Why would you need to draw through your deck a second time? This is a wasted card slot! When you are playing most Criminals, Levy is very tempting because it is hard to get your icebreakers back if something unfortunate happens to them. There aren't any good in faction ways to do that. But it's three influence for Levy, and often it will be completely useless. If you are worried about losing your icebreakers, you could just include an extra copy of your icebreakers. And you can compound your Levy problems even worse if you want to feel really safe... maybe you play a copy of Same Old Thing even though your deck doesn't especially care about repeating events, just to make sure you keep your ability to play Levy. Maybe you never play that copy of Déjà Vu you drew because you want to save it to get back Levy. That's bad! Did I draw Levy? If I did, did I ever want to play it? If I didn't draw Levy, would I have wanted to play it if I drew it? If the answer is usually no, cut it! Levy is a very good card, but it is important to know when it isn't. Also, if you are looking for a specific solution to decks that are trying to run you out of cards, you'll probably be better off with a more dedicated card like Feedback Filter or Net Shield. Played with Comet on the board, you could redraw a fresh hand and then play a second event without spending a click. Though the influence is high (3 points), it could help give MaxX: Maximum Punk Rock a new lease on life. Dug down and found some of the pieces you need? Start over and get the rest! Using event econ? Never quit your Day Job. Noise: Hacker Extraordinaire is making great use of Aesop's Pawnshop for econ, with Grimoire + Cache and Déjà Vu and Surge . . . and he can get them all back, maybe even tutor them back out if he's using Djinn, if he spends some time in the Lab . . .
And of course it also gets back any important cards lost to damage of all kinds, and with all the tutors in Shaper (Self-modifying Code, Test Run, Trade-In) you could easily pull them from your deck once you've shuffled them back in. Just some thoughts, I hope to find more as I play with this card! Why would you pay 5 to recycle your deck since it has already been used and your cards installed? The "draw back to five" effect is clearly not worth the credits and the horrifying influence.